When we fix some electronics at home or our work involves fixing electronics soldering iron is an important tool. Soldering iron is a great tool that allows us fix many electronic devices or make new ones. Many people need soldering iron in their tool boxes. There are many types of soldering iron available in the market, from basic to professional ones. This makes it very difficult to choose one. That is why I made a list of six great soldering irons with highest user ratings and reviews available on Ebay and Amazon. This one is not just a soldering iron but it is also comes with a base unit and iron holder. It comes in orange color. The base features on/off switch with power-on indicator light. The iron allows power control that produces from 5 to 40 watts. This is a very high quality and light soldering iron. There is also a sponge for cleaning the iron. The tip is iron plated copper and Weller offers a variety of compatible tips for different soldering needs with ST3 compatibility. This makes it easy to use any ST3 compatible tip from any manufacturer. There is also a foam grip on the iron to protect hands from high heat. This iron has highest customer reviews and just for $40 this is one great soldering iron. For just $8 this one is just one of the cheapest soldering iron available on Amazon. It is also one of the very basic ones, as it does not include any stand, base or even a foam on the handle. But do not let the looks fool you. This product has second highest user reviews and solid 3.5 rating. This is not a premium or professional product. However, if you are looking for something simple and can get things done or if you just learning how to use soldering iron, this product is indeed for you. This iron comes with two tips, one is pre-installed while other is in the packaging. This is a great beginner’s soldering iron. This soldering iron comes in a kit. It is similar to the previous model, as it features just a normal soldering iron. 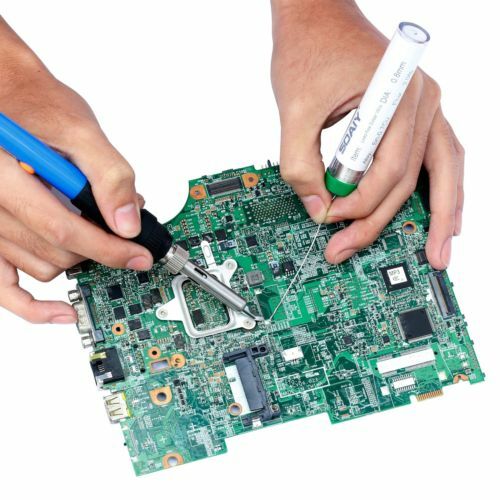 However, it comes with a large amount of accessories, which include 5pcs different tips, desoldering pump, stand, anti-static tweezers and additional solder tube. New steel pipe system creates a faster heat dissipation. This iron is rated as 60 watts, which is more than enough for most of the soldering work. Several tips allow different kind of solder. In short this is one of the cheapest professional soldering irons, enough for experienced and a beginner. This one is another great soldering iron. This is a professional model. It comes with a high quality holder and a base. Base has on and off switch, power on indicator and power adjustment knob. Holder is separated from the base which makes it easier to use. The cable is long enough to solder big items. This iron is designed for continuous working. The tip is high quality and small for precise soldering. Iron is detachable and replaceable and comes with several safety features. This iron might be costly, but it compensates with performance and safety. This is just like Vastar a soldering iron with a plenty of accessories. This is a six in one set which consists of carry case, soldering iron, 5 soldering tips, soldering sucker (desoldering pump), solder wires and a stand with cleaning sponge. This is also 60 watt iron which heats up quickly and has better heat dissipation due to the high quality tip and ventilation holes. Five replaceable tips come in handy when doing different kind of soldering or wood burning project. This is a good and powerful soldering iron with many useful accessories. This is a last soldering iron in our list. Currently only at $24 which is only half of its original price, this is a one powerful kit. Just like other kits this comes with many accessories, however it has much more accessories than any other iron featured in this list. The accessories are 5pcs tips, desoldering pump, 2pcs tweezers, tin wire tube, stand and 6pcs aid tools. These all come in PU carrying bag. Iron is 60 watts rated and it is powerful and allows easy heat dissipation. Handle comes with plastic portion near the tip to protect the user from burning his hands. This one is indeed one of the best value irons with many accessories. This list consists of six different soldering irons that are suitable for beginners or professional users. With all that variety of irons available in the market, we hope that our list can help you to decide which one to buy.